These Marshmallow Popcorn Balls are sweet and salty, crunchy and chewy. And they’re soft enough to be pulled apart with your fingers. Incredibly perfect! Mom used to make old fashioned popcorn balls for Halloween when my sisters and I were young. But then her reliable candy thermometer broke, and she says she could never get the popcorn balls just right after that. Her fall tradition sadly ended up biting the dust. Admittedly, I can be a bit of a popcorn ball snob. I learned very early on that many popcorn balls are densely packed and hard as rocks. After almost breaking a tooth a few too many times, I’m now very hesitant when one is offered to me. But I still crave them, all sweet and sticky. So, because I’ve missed them so much, I came up with a solution…Marshmallow Popcorn Balls. My aunt Roxie was such a dear to mail me her original Popcorn Cake recipe cards, a handful of special family photos, and a lengthy letter telling of all the celebrations this cake has witnessed over the past 30 years. Roxie’s mom (upper right photo), now 92 years old, started making these cakes in an angel food cake pan for her grandchildren’s birthdays. So popular, the recipe became part of her family’s holidays, too…green and red gumdrops for Christmas, orange for Halloween, green for St. Patrick’s Day, and red for Valentine’s Day. 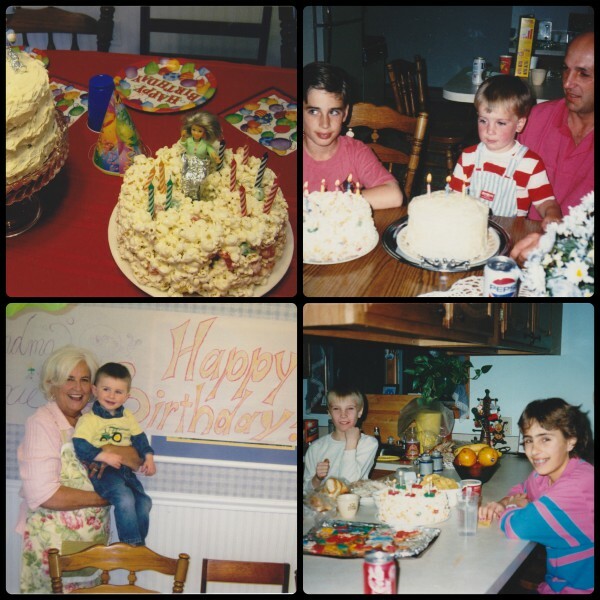 It’s great fun for me to hold these photos of my aunt Roxie (lower left photo, holding her grandson), my uncle Arnie (upper right photo), and my four cousins…all having their moment with this fabulous cake. They bring back so many happy memories of birthday parties and holidays celebrated together. I was happy to learn that this tradition is still going strong in Roxie’s family, and that it has managed to spread beyond the family lines, into the homes of their friends. She doesn’t think their friends have quite as much fun with it, though, since they have taken to actually cutting the cake into pieces (gasp!). When Roxie serves the popcorn cake, her family and friends just pull off as much as they want. I have to agree…pulling a sticky marshmallowy handful of popcorn cake away from its straight pan-formed edges is just part of the delicious experience! 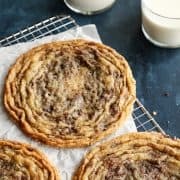 Thank you, Roxie, for sharing your stories and photos, and making this recipe even more special to me than it already was! Place popped corn in a very large bowl, removing any unpopped kernels. In a medium pan over medium heat, melt the butter and marshmallows, stirring frequently. Take care to not let the marshmallows scorch. When the marshmallows are almost fully melted, take pan off heat and stir to melt completely. Pour half the marshmallow mixture over the popped corn and fold gently to coat the popcorn. Pour the remaining marshmallow mixture over the popped corn and fold again to coat completely. Add the peanuts and fold again. Add half the orange pieces and fold. Add the remaining orange pieces, folding to fully incorporate. Place the tablespoon of butter on a plate and lightly rub some on your fingertips and palms. 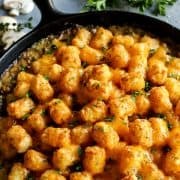 Gather up a generous half cup of marshmallow popcorn mixture (I like my popcorn balls on the smaller side) and gently mold into a ball shape, almost 2-1/2” in diameter. Don’t press the balls too tightly, or they will have a harder texture. Aim for balls that are held together as lightly as possible, and they will be much more enjoyable to eat. Place on waxed paper and sprinkle lightly with nonpareils. To give as treats during trick-or-treating or at a Halloween or harvest party, bag individually and tie with a festive ribbon. Adapted from my aunt Roxie Klein’s popcorn cake recipe. Any idea how long these would store if they were each wrapped individually and tied with a ribbon? I need to make hundreds of them so I need to make them in advance, but wondering how far ahead I can start! 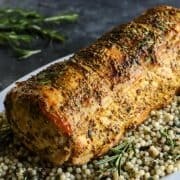 These look fantastic!!! Hello Jen – these are going to be best when they are as fresh as possible. If it were me, I would think if they were made a couple days ahead of time, they would be just fine. I love everything about this post…your posts, the history of the Popcorn Cake, and of course, your recipe. This is the stuff that is so important to document and share….was such a fun post to read. These look delightful! 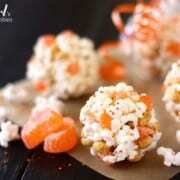 I’ve never actually made a popcorn ball but they look really easy and I know my lil pumpkin would LOVE them! Could I substitute candy corn for the orange slices? 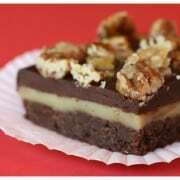 This substitution might send my hubby over the edge in love with this treat! :-) Thanks so much! I think candy corn would work just fine in these. I would just stay away from anything that melts easily, because of the warm marshmallow mixture & forming the balls with your hands. Please let me know if you try it! So fun! I love all the sweet additions! 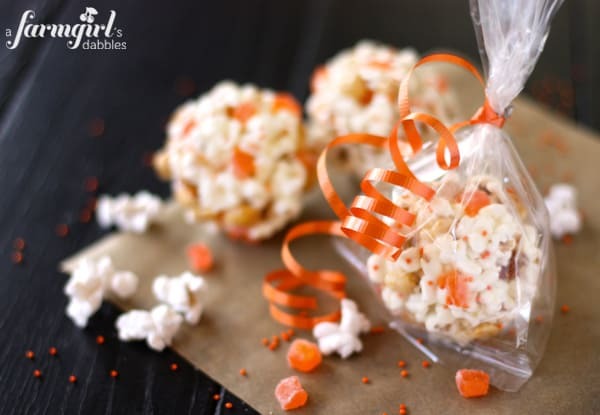 Brenda – these bring back a flood of memories of the popcorn balls I’d make with my Grandmother for Halloween. Oh I love this post Brenda!! the pictures are wonderful…and so is the recipe. My kids would love this! so fun! it’s tradition in our house to have popcorn balls for Halloween! 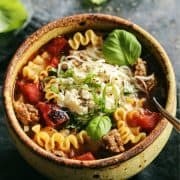 Been lurking and cooking up a few of your recipes. LOVE them. My question: Can you substitute the candy for caramel or butterscotch chips? I had a bad experience with jelled candy slices. Long story short…had a very smart greyhound that liked to remove the candy dish lid and move the candies around until she found the right one. Greyhound goobers are not cool! Hi Teri! This recipe can handle most anything. I would just be careful about using something that easily melts, as you’re working with warm marshmallow and forming the balls with your hands. I’m not sure how butterscotch chips would hold up. What a great family tradition to revive. 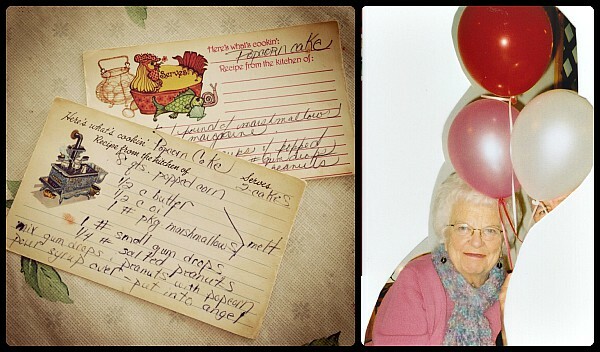 I love all your nostalgic photos and original recipe cards…these are some of my favorite memories as well – time spent with my mom and grandma in the kitchen! Thanks bunches, Amy. I love my digital scrapbook!! I love the old photographs! And the addition of gummy orange slices is a deal maker for me -love those things! These popcorn balls sound wonderful. I love the addition of the orange slices. 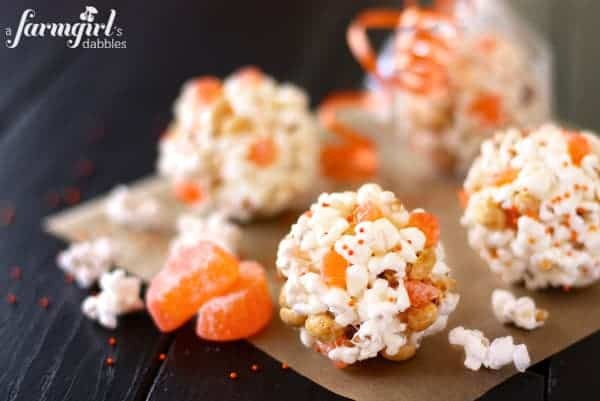 What a great idea to add orange gumdrop candy to these! 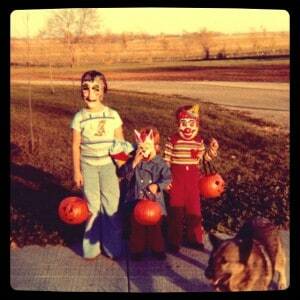 My Great Aunt Mildred always handed out giant popcorn balls at Halloween….ah I miss her. Thanks for bringing back such a great memory. 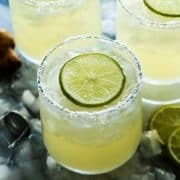 I may have to make some in her honor. I’m liking the idea of softer popcorn balls and who doesn’t love marshmallows? That’s great to hear, Paula – thanks! What fun memories these bring back! Making popcorn balls is so much fun! Love that these are so soft! More than anything that old Halloween picture with those masks bring back SO many memories. We have so many pictures like that!! 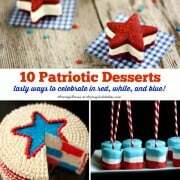 These look so fun to make!! Our girls got the biggest kick out of that picture. Just a hard plastic mask was all it once took to trick-or-treat! It’s such a production these days. These were my favorite as a kid! I am a big popcorn ball snob – I only want the good homemade ones! I do love making them too! These are so fun and festive, Brenda! 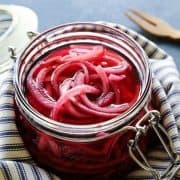 Love this easy to make recipe from Roxie. Craving one right now!